So, here we have a lovely Ikat fabric print. Here, I have “married” the images to create a large piece of fabric – wouldn’t these make amazing window treatments or bed spread? Now, this is a busy pattern, can you spot the mismatch? Click on the image for a larger view. Okay, so, as you can see, the patterns aren’t matching either horizontally or vertically. And this image shows the “pieces” of the images as they are laid out next to each other. And below, you can see that in order to match the fabric, we’re losing quite a lot of fabric. Instead of three equal pieces, we have one full piece and not quite half of the other two. This is obviously a very basic example of how a pattern match works. It also shows that a good pattern match takes more fabric (or wallpaper for that matter) than not matching the patterns does. Now, most quality fabrics are printed so that they can be matched fairly easily without a lot of loss when used in large swaths – such as window treatments and bedding, etc. But when it comes to upholstery, a good upholster will match the patterns across “breaks” or seams in the design. This gets a little dicey when it comes to store bought pieces. Even those which say they are custom made-to-order can arrive with poorly matched patterns. Take for example these two chairs from Pottery Barn. Ranging between $1,000.00 and $2,000.00, these chairs are not inexpensive. What you should expect is that the pattern is centered across the back cushions and run down the seat, the box and down the skirt or upholstered front of the piece. It should look as if the fabric was pulled off the roll and laid down the front. The tops and fronts of the arms should match each other as best as possible, as should the sides and the back. These are really not good and not worth the cost. Now, imagine you order a pair of these? They will likely not match each other and you will end up with a cacophony of pattern that is anything but pleasing to the eye. The pattern is ruined by how it’s used. Now really how we should be spending upwards of $4,000.00. Now take these simple drapery panels. Nothing could be easier. These are a single width of fabric, hemmed with grommets added. But look at the pattern placement across the two panels. They should exactly match. The pattern on the left panel is a good inch higher than the pattern on the right. Unfortunately, for inexpensive panels with a pattern, this is probably the best your can expect. The reason the pattern aren’t matched is that it takes more material and skill to do it. And the larger the pattern is (also known as the repeat), the more potential fabric will be lost in getting the match right. And now, here are some examples of some beautifully matched patterns in wallpaper, window treatments and upholstery. Galbraith & Paul Persian Garden floral wallpaper and fabric. How gorgeous is the pattern match across the wallpaper and window shade? Mark Hampton design for Estee Lauder Pierre Frey Toile de Nantes – another example of beautiful pattern matching across wallpaper and drapery and also on the chaise. Note that the “squiggle” pattern on the valance is just about the same width as it is on the flat pattern. And the skirting on the chaise is perfectly matched – on all sides – to the cushion. Mark Sikes Design | Linda Holt Creative photo. Blue and white floral curtains wallpaper. Note how perfectly matched the pattern is across these window treatments. Blue and white ikat chair from Horchow (no longer available) – look how beautifully the pattern drapes down the front of the chair. It’s centered perfectly and if you let your focus go off a little, you will see an overall light versus dark pattern at play here as well. Note the arm fronts are nearly identical. It’s not always possible to achieve a perfect match because fabric is printed left to right so it’s difficult to get a mirror image sometimes, but in this case, they did a pretty good job of it. If you cut this chair in half and put it back together, it wouldn’t look so different. Which is just what I did below. If the arms weren’t slightly different in the image above, I’d have wondered if they mirror imaged the photo for marketing purposes. Schumacher’s Cambay Paisley Print fabric is featured on this arm chair. 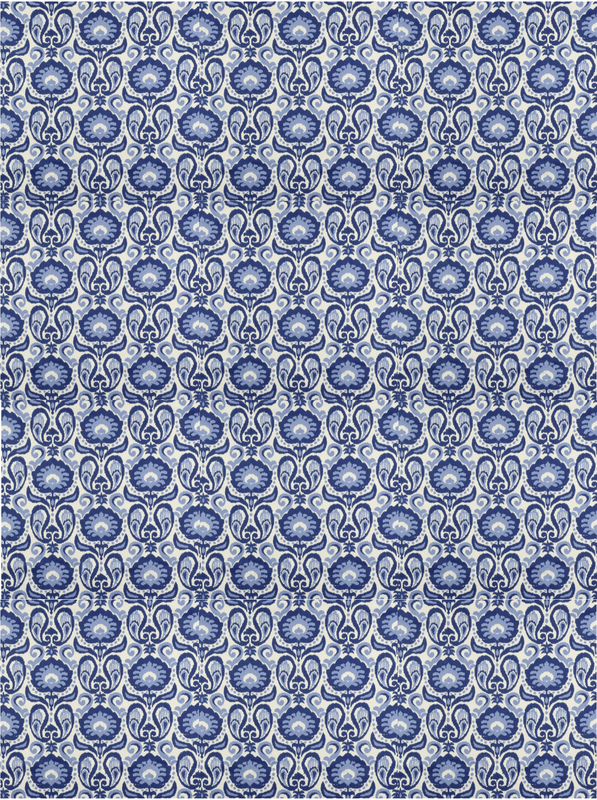 This is a very large repeat pattern at 52-1/2″ wide (full width of fabric) and 33″ Vertical. The upholster/designer chose to “flip” the pattern so that the smaller orange “flame” (for lack of a better description) is on the base of the back cushion and the larger orange flame runs down the front. Not how the patterns on the front of the arms are identical. Because this fabric pattern is a mirror image across the width of the fabric, you get the possibility of mirror image matching patterns on the upholstered piece. Anthropologie Sketched safari Holloway chair – This cute little chair really captures how well a good pattern match will work. Can you imagine if the elephants weren’t all walking in a straight line? Of course, most of these images above are showing top of the line designer workmanship – which costs a lot of money because of the skill it takes to lay out and cut the fabric and of the waste factor involved. So, what can you do if you’re on a budget? Pay close attention to the photos or floor samples of any furniture or window treatments which feature a clear pattern. Marketing photography and floor samples are the best iterations of these items – they are there to sell the pieces to you. If they don’t look as you would like them to, they certainly won’t when delivered. At better retailers like Crate and Barrel, Horchow etc, make a point of speaking with the sales people about your desire for a quality pattern match. If they aren’t willing or able to work with you and you are concerned about how it will come out, perhaps select a different fabric. You can always do a solid upholstered fabric with the pattern you like on a pillow. You can mitigate any potential matching issues by splitting up the pattern. Anthropologie Pied-a-terre sofa. Note the seat cushion and front end of the sofa are in coordinating fabrics from the back and sides. Even just a solid seat cushion would be enough to break up the pattern so that the front edge wouldn’t need to be a perfect match. Window Treatments from retail stores are tricky because they are usually sold in single units and are almost never matched. But if this is where your budget is (which is totally okay), then buy several more panels than you need and try to pick out the one’s that match the closest, then pack up and return the rest. If you can sew and you’re ordering rod pocket panels, you can also order longer panels than you need and alter them so that the pattern matches better. What do you think? Is a good pattern match a match made in heaven? Thanks so much Mary Jo! I am struggling with a pattern match on a vervain fabric (Doucette). Doing a box pleat valence is not working with the pattern as well as I had hoped, so I realize sometimes you have to change the design after you are into it and start over. I can’t say how important pattern match is and how few people address it. Thanks for the article. Hi Ingrid – thats a lovely fabric! I’m sure we’ve all fell in love with a fabric and struggle to get it to work within a particular design. As I said in my post – design is all about problem solving, and the details! Good luck! You’ve made some very good points on a topic all designers should understand. Pleating a drapery heading to pattern takes extra fabric, planning and skill but looks beautiful when done correctly. One thing to keep in mind with upholstery is the seat cushion can only match one way; once the cushion is flipped, the pattern will be interrupted. Stylists should be mindful of this when doing a photoshoot. Designers need to attach a cutting to their work orders specifying right side of fabric, direction of design, and pattern repeat (both vertical and horizontal) and motif placement, so that workrooms don’t have to second guess. Communication is key to get the results your clients will appreciate. Hi Merlyn! Excellent points all, thanks! I would say regarding the seat cushion, if flipping potential is important, than a band of solid or multi-direction coordinating fabric (like a stripe) for the box banding might be considered. And you are so right about photoshoots!